If you’re anything like me, I imagine you’re probably constantly on the lookout for recipes that are quick enough to prepare on a weeknight, don’t require special ingredients, and are ridiculously easy to prepare. Well then, you’ll love the 4 recipes I’m including in today’s Financial Friday post—each of these recipes is largely based around items you probably already have in your pantry, and each one takes 30 minutes or less to prepare. Plus you’ll save money every time you choose to make one of these dishes rather than opting to get takeout (again). Place 3 cups of dry elbow macaroni in a boiling pot of salted water. Meanwhile, thoroughly cook (using a spatula or wooden spoon) one lb. of ground beef or ground turkey in a skillet. When macaroni has been boiling about 7-8 minutes, add about 3/4 cup of frozen peas to the boiling water with the macaroni. When macaroni is soft and peas have been cooked through, drain them in a colander and then put them back into the pot. 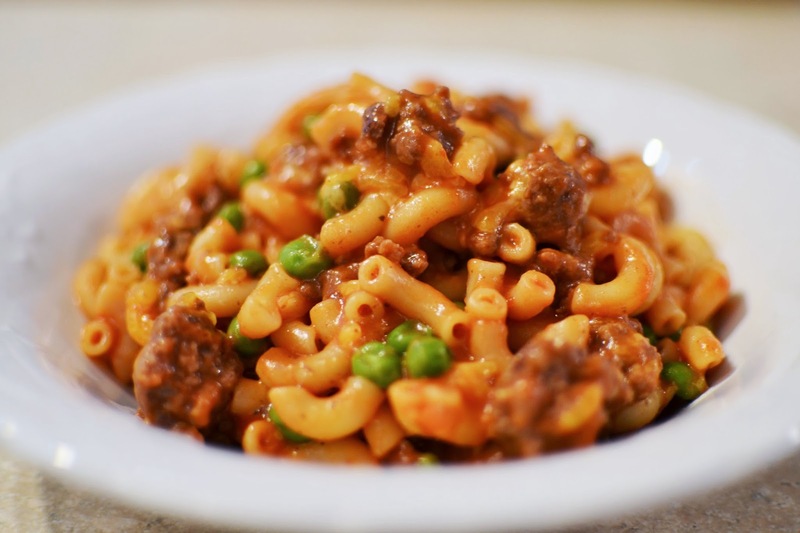 To the drained macaroni and peas, add the pound of ground beef, two cans of cream of tomato soup, one 8 oz. can of tomato sauce, and about one cup of grated cheddar cheese. Salt and pepper to taste. *Note: you may want to keep the stove burner on low while you’re adding the rest of the ingredients at the end so that the cheese will melt and everything will heat up accordingly. Here’s another favorite stolen from my mom (and adapted to our tastes). In a large skillet, thoroughly cook one lb. ground beef and 1/4 cup finely chopped yellow onion. Salt and pepper ground beef while cooking and add 1 teaspoon garlic powder. When meat is no longer pink and onion is translucent, add one can of cream of mushroom soup mixed with a little bit of milk (can add two cans of the soup if you want to double the amount of sauce), 1/2 cup sour cream, and two tablespoons Worcestershire sauce. Heat the mixture through. Serve over steamed white rice. *Note: We really like opening up a couple of cans of green beans and serving them alongside this dish, or just mixed right in. I got this recipe from a Taste of Home cookbook and have made only minor alterations to it. I make this recipe almost as much as I make the hamburger casserole. In a large skillet, thoroughly cook one lb. ground beef, one finely chopped yellow onion, and one minced garlic clove until meat is no longer pink and onion is translucent; drain. Add one can of cream of mushroom soup, one can of corn (not creamed), and one 4 oz. can chopped green chilies. Mix well. In a 9 X 13 baking dish, pour the soup/meat mixture and put a layer of tortilla chips over the top. Pour a can of red enchilada sauce over the whole thing, and top with about one cup of shredded cheddar cheese. Bake (uncovered) at 350 degrees for about 8-10 minutes, or until heated through. Here’s a recipe I got from my mother-in-law, which I’ll occasionally tweak with the suggestions found below in the note. In a large skillet, thoroughly cook one lb. ground beef and one finely chopped yellow onion until meat is no longer pink and onion is translucent. When meat is cooked through, add it to a large stock pot along with two (16 oz) cans of kidney beans, one (16 oz) can of corn (drained), one (8 oz) can tomato sauce, one (26 oz) can stewed tomatoes, and 1/2 package of taco seasoning. On medium heat on the stovetop, heat everything through. Garnish with sour cream, shredded cheddar cheese, and tortilla chips. ***Note: This soup can be made without the meat–simply take out the beef and replace it with a can of green beans (drained). If you don’t have taco seasoning on hand, flavor the soup with 1-1/2 teaspoons of each of the following: chili powder, paprika, and cumin, and one teaspoon each of onion granules and garlic powder. Add salt to taste. What are some of your favorite go-to meals that use items from your pantry?